Chilmark is a small town on the island of Martha's Vineyard in Massachusetts, known for its rolling hills, picturesque farms, and beautiful beaches. Its year-round population of 905 (as of 2014) swells dramatically in the summer, as 75% of Chilmark’s 1,606 homes are seasonal. The minimum lot size for new construction in most of Chilmark is 3 acres, though there are many buildable pre-existing undersized lots. The average house size is 2,350 square feet and more than half of the homes are smaller than 2,500 square feet. In recent years, the size of new houses has been getting bigger, resulting in growing public concern. 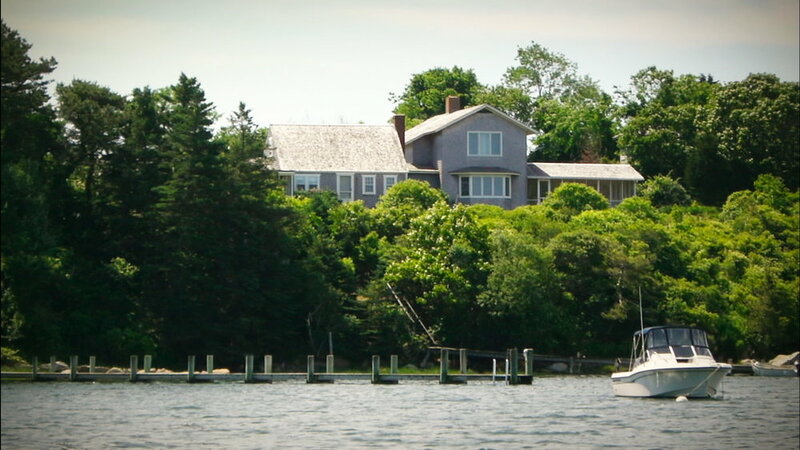 Typically, larger houses are built as seasonal homes taking advantage of water views, and are heated year round. There are 26 houses larger than 6,000 square feet; one of the largest is around 14,000 square feet. Every community has characteristics that create its identity or sense of place. Perhaps the homes are historic, or modern, are densely packed in high rise apartments, or are largely cottages. I have come to believe that every community has the right to protect its sense of place. In Chilmark, this is accomplished by citizens voting for or against zoning regulations to collectively balance individual rights to private property with the community's rights to protect its defining characteristics. A scatter chart showing single family home living area in relation to lot size. This scatter chart from 2012 shows that the majority of houses in the town of Chilmark are well under 4,000 square feet. It helped to show that the character of our town was not made up of extra-large houses and we wanted to keep it that way. 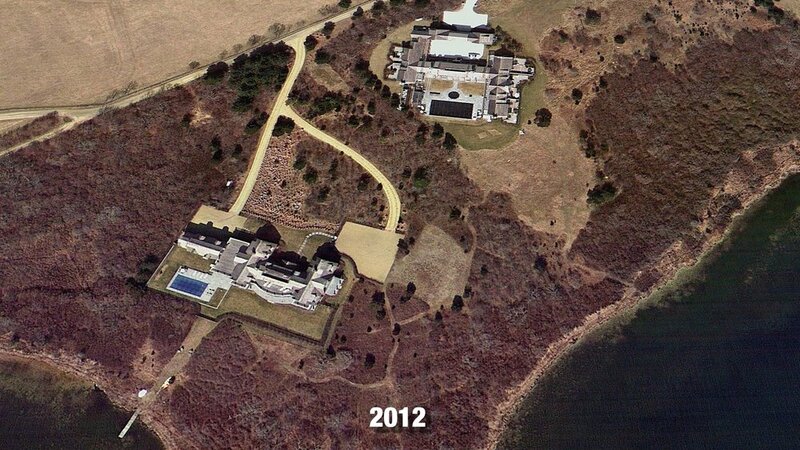 Recently, mega-mansions have been replacing smaller homes on Martha's Vineyard. The images below show are examples of these changes. A home is replaced by a much larger mega-mansion, with large accessory buildings (not pictured), changing the character of the cove. The image above shows only the main house but a significant part of the controversy was two large accessory buildings (visible in the image below) that took advantage of loopholes in the zoning laws. One of the structures is a five car garage that was called a "barn" and a "detached bedroom" that was larger that the legal limit for guest houses, and included an indoor swimming pool. 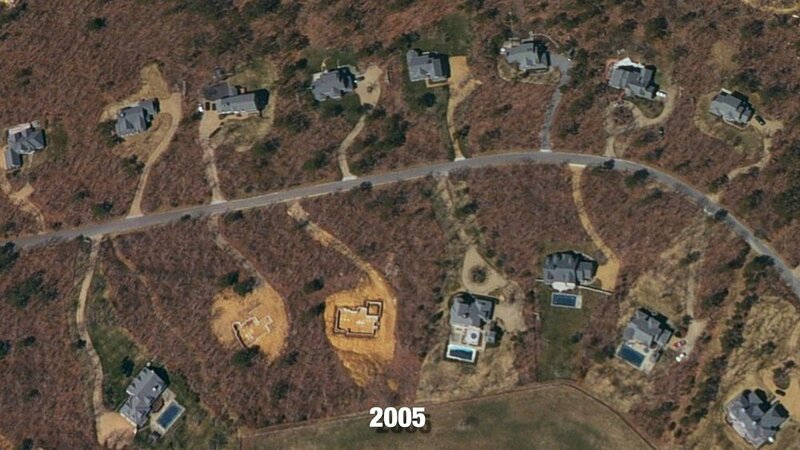 Below are other before and after images of the changing landscape of Martha's Vineyard. Chilmark’s large house bylaw was prepared by the Chilmark Planning Board, which held dozens of public meetings over a year and a half. It was approved by a vote of 162-51 at the April 22, 2013, annual town meeting. The Planning Board’s goal was to craft a bylaw that allowed reasonable use of property but reduced the negative impacts on abutters and the community at large. The aim was to differentiate between a large, highly visible house on a small property, and a well-designed, well-landscaped house on a large though barely visible property that minimizes its energy consumption and impact on water quality. Also, the aim was to allow additional floor space on larger lots, to remove the incentive to subdivide property and build even more houses. The proposed bylaw requires that applicants for larger homes go through a design review process, which is not needed for more modest homes. The bylaw allows 3,500 square feet of floor space on a basic 3-acre lot, as of right. Owners can apply for a special permit allowing up to 6,000 square feet, with the Zoning Board of Appeals reviewing the application to ensure that the project’s environmental impacts have been minimized and mitigated. These include visual impact; effects on water quality in coastal ponds; effects on traffic, habitat, and wetlands; energy usage; and effects of exterior lighting. The bylaw allows for an additional 250 square feet for each additional acre of property; smaller lots would have 250 square feet less per acre. It also allows a one-time addition of up to 5% of the floor area, to buildings that already exceed the limit. The Planning Board calculated that between 2000 and 2013 eight houses had been built that exceeded the new limits. A 2016 modification to the bylaw exempts the square footage of historic homes, to provide a bonus for their preservation. Under Massachusetts law, a town is not allowed to set an absolute limit on the interior size of a house, but jurisprudence indicates that limits that vary by property size, such as in the Chilmark bylaw, are permissible. You can download the bylaw here. Two years after the "big house bylaw" went into effect the fears of many who voted against the bylaw failed to manifest. The real estate market did not suffer, property values continued to rise, and the construction industry showed no significant impact. In those two years, nobody applied for a special permit to build a home greater than the size limitations. One unintended effect of the bylaw was to potentially encourage the tearing down of historic homes in order to build a newer structure that would otherwise have been prohibited because of the size restrictions. An amendment was passed in 2015 to prevent this potential impact and there were no known instances of this actually occurring. In 2017 the town of Truro, Massachusetts passed a big house bylaw modeled after Chilmark's. The organization "Save Truro Seashore" screened One Big Home multiple times to galvanize support in their community. In February 2018, I (Thomas) attended the biennial review for the Chilmark big house bylaw. We passed our big-house bylaw in 2013, and since then, building permits have remained steady (for both new construction, additions, and renovations) and property values have continued to increase. As Peter Cook (member of Chilmark's Planning Board) stated, "It seems like there is more awareness that bigger isn’t sustainable…at least more awareness than a few years ago. The bylaw works." In accordance with the bylaw, the planning board released their 2018 biennial report that summarizes their findings. As with 2015's biennial review, the data is clear. There is no substantial downside to limiting house size. Part of the motivation for limiting house size in Chilmark, was witnessing the rapid development of similar nearby locations like The Hamptons. Over the course of several decades, a rural area transformed into resort communities where affordable housing disappeared and where giant houses transformed the community and landscape. 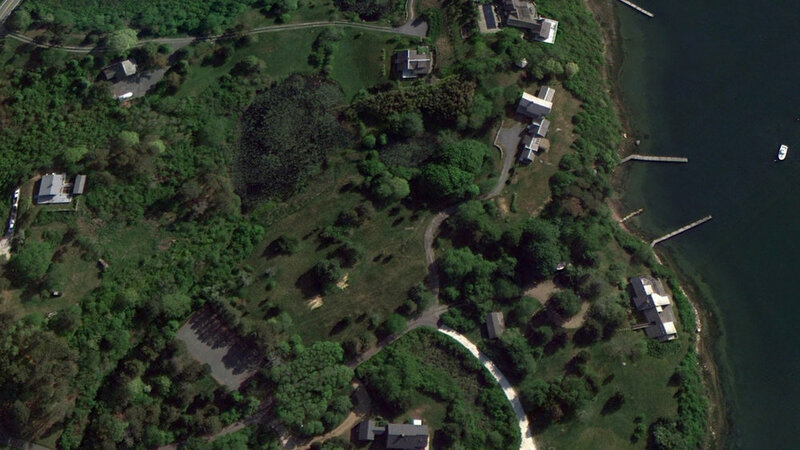 The Rennert mansion below was so large it caused an uproar even in the Hamptons. At over 110,000 square feet (all buildings), it caused the community to pass a size limit on new homes. 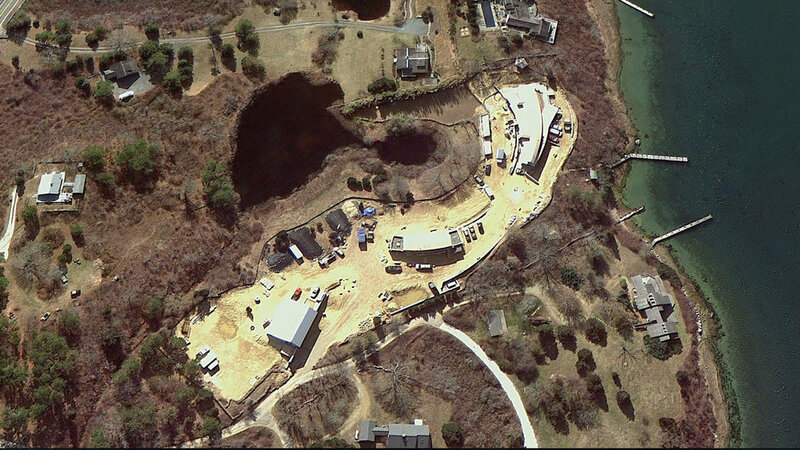 2013 April: Scouring seas were closing in on a Chappaquiddick manse. The owner is now moving it all-but to what end? 2011 April: Would you like ties on that Mcmansion?